Purchase decision for a secure bike lock. 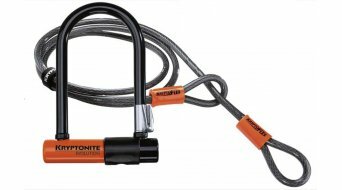 You are looking for a bike lock so that you can leave your bike with no worry even when on the road? Here you can find an assortment of various types of bike locks from top brands like Abus. Whether it is U-lock, chain lock, padlock or folding lock. Because there are so many types of locks, you should be clear before buying about what the new lock should do. The decisive factors are the design, weight, handling, and price. Is the bike often left in risky areas and thus requiring an accordingly high security level (train station, downtown, etc), or do you need the new lock only to secure your bike in a nearby excursion area, when you are within reach and do not stay for too long? How valuable is your bike? How popular is the model of your bike in the eyes of bike thieves? All these criteria should influence your decision on which model you should buy. Warentest Foundation claims that according to the latest test in 2013, only a few locks provide the desired protection. Even the secure bike locks that are regularly tested and recommended by the big biking magazines. You should consult such tests to make your decision and inform yourself about recommendations. You can find many popular test winners here in the shop labelled with an award icon. Some manufacturers classify their locks into levels which assign the security to values on a scale. This is of course helpful given the wide range of choices. A low security level can be found most of the time in models that are small and practical, to make transportation easier – a simple pad lock / spiral padlock for example. Folding locks are a good compromise; a robust folding lock provides security and yet can be stowed away neatly in a bike backpack. When you really need a lock with really good protection from thievery, it follows that you have to accept the additional weight. U-lock and chain lock are the right choice in this case. Due to the thick steel U-bolts or chain links, it requires more practice, time, and special tool to break such locks. That is an obstacle for bike thieves at least in public areas. There is no such thing as one hundred percent security, but with the right choice of lock, you can limit the risk of thievery and leave the bike behind in a parking lot with no worry. Discover the various designs here in our shop for bike locks! We also offer suitable accessories and small parts.